Introduction: In this article, Mary Harrell-Sesniak searches old newspapers to find letters that children wrote to the editor, and shows how much surprising genealogical information these letters contain. Mary is a genealogist, author and editor with a strong technology background. It’s sometimes hard to find information about our ancestors when they were children, but here’s a source that might help your family history research: letters written by children that were published in the local newspaper. We often don’t think to look, but children wrote letters to the editor, just as adults did. Most were letters to editors of kid-friendly special features of the newspaper. Some of the writers of these letters are not identified fully, but others tell us their full names and addresses. 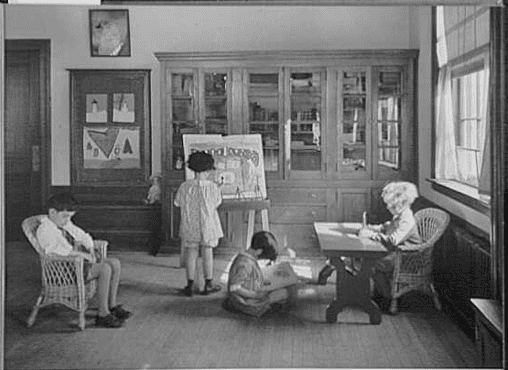 Photo: children painting, reading and writing, between 1930 and 1940. Credit: Samuel H. Gottscho; Library of Congress, Prints and Photographs Division. You can never tell what else you’ll find, but many of these treasures include a surprising amount of genealogical information. Little ones love to talk about their lives, so you may uncover names and ages of siblings, what day-to-day family life was like and even a middle name or name of a teacher and school. Let’s explore some of these charming missives. 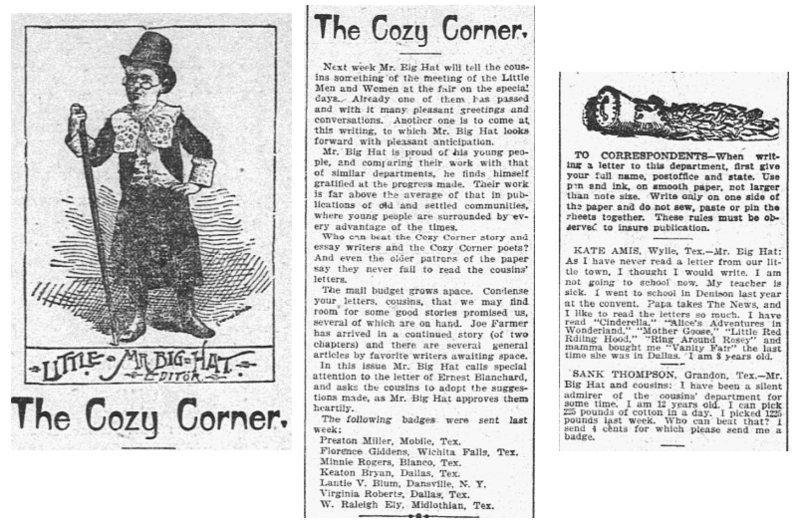 A popular 19th century column in the Dallas Morning News was “The Cozy Corner.” Children were given detailed instructions on how to write to “Mr. Big Hat.” They were to use their full name, post office and state, as well as to write in pen and ink, on smooth paper and only on one side. Recognition in the way of badges was given to several writers. This issue recognized: Preston Miller of Mobile, Florence Giddens of Wichita Falls, Minnie Rogers of Blanco, Virginia Roberts of Dallas, and W. Raleigh Ely of Midlothian. These children were all from Texas, but Lantie V. Blum of Dansville, New York, was also recognized. 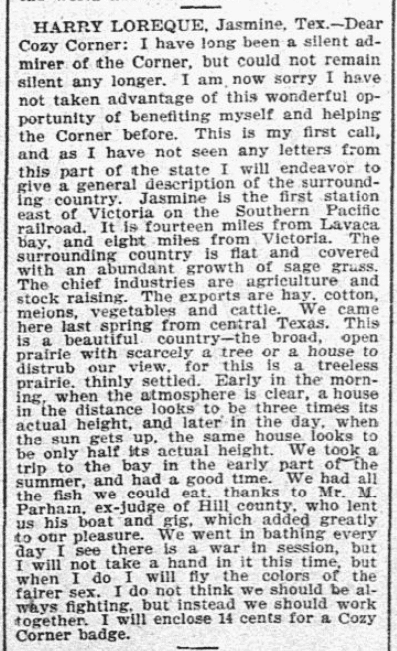 Another interesting aspect of this column was that letters were often quite long, such as this one by Harry Loreque of Jasmine, Texas. In this clipping, there are two letters. In the first we learn that Dorothy Virginia Potts had written previously, that she was trying for the honor roll, and that she had three kittens (all named). Her home address was 529 Colley Avenue in Norfolk. The second letter was from Henry (“Harry”) Russell, whom I found on Findagrave.com. Henry Hudgins Russell was buried at Riverside Memorial Park and we can note a spelling variation. In the 1912 newspaper article, his middle name was recorded as “Hudgin” and not Hudgins. His brother was buried at Rosewood Memorial Park. Wonder if the family knows that at one time Henry’s baby brother, George, was nicknamed “Peanuts”? 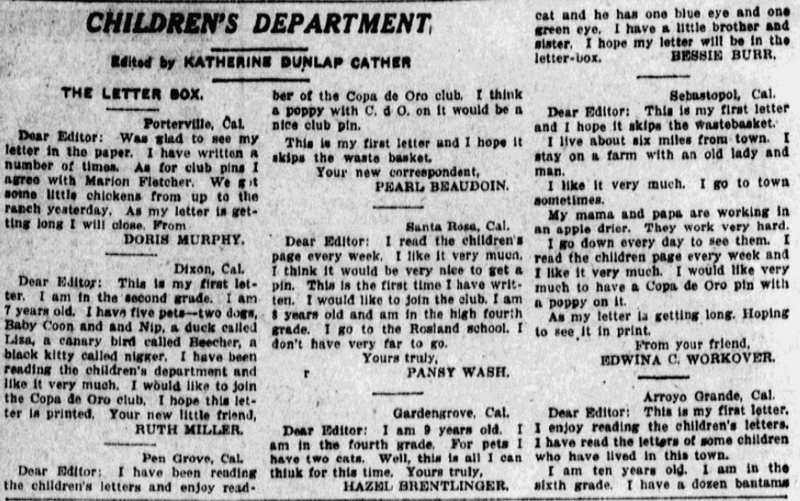 The children’s feature from the San Jose Mercury News was called the “Children’s Department.” In this issue we see that Doris Murphy, Ruth Miller, Pearl Beaudoin, Pansy Wash, Hazel Brentlinger and Edwina C. Workover all submitted correspondence. A quick look at Findagrave shows that Edwina and her husband Arnold Workover are buried in Green Valley Cemetery in Sebastopol, California, the same town where she lived at the time of this letter. If her descendants were wondering when the family moved from Napa County where she was born, this letter could be used to establish residency. 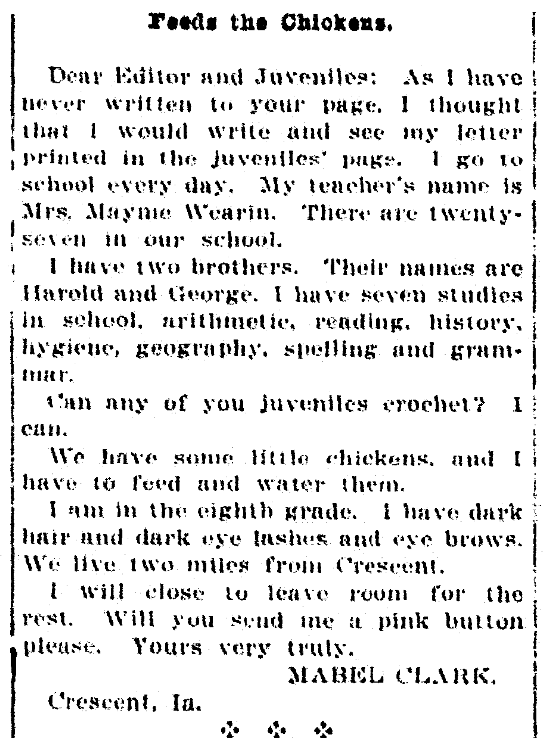 Mabel Clark of Crescent, Iowa, disclosed her teacher’s name and how many students were in the school. More importantly, she named her two brothers, Harold and George, and told us she was in the 8th grade in 1917. She also gave a detailed description of her dark hair, dark eye lashes and eye brows. The family lived two miles from Crescent. Her teacher was Mrs. Mayme Wearin, and at her young age, Mabel liked to crochet. Other letters on this same page disclosed the size of a family farm, details about family pets, how much money a family received for eggs and crops, and even that one child played the violin. If you enjoy searching for letters by children, you may wish to read my article Did Grandma & Grandpa Write Letters to Santa Claus as Kids? Search for letters your ancestors may have written when they were children in the pages of GenealogyBank’s Historical Newspaper Archives.